Are you tired of the old drive-in movies? Hot tub cinema came out with a new concept based on it. You can enjoy a great movie while relaxing in a hot tub. During the summer they are located on rooftops in central London. When in winter they take their concept indoors. The events they organize are public and you can rent a tub with your friends or get a ticket to share a tub with other people. Besides the public events you can also contact them for private events. At the moment they are only operating in London and the UK, but they are preparing to go internationally in the future. 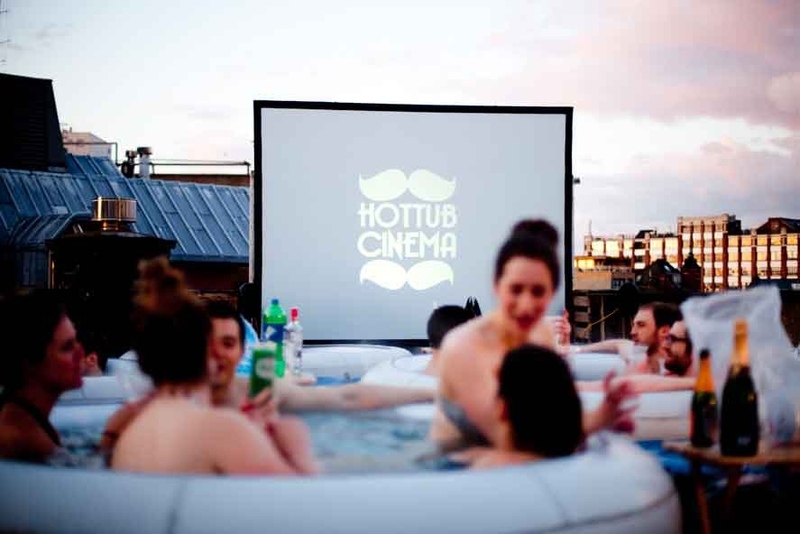 Since the first rooftop screening in 2012 the event has grown so they have 20 hot tubs, 2 screens and a surround sound system for the real cinema experience. One little thing to mention is that the movies played aren’t the most recent ones. For more information on dates, movies and prices, check http://www.hottubcinema.com. I would love to try it out sometime. This entry was posted in Uncategorized and tagged cinema, Hot tub, London, movies by missnathaliexo. Bookmark the permalink.